2016 is certainly a big year for cricket and New Balance. The company renowned for making some of the best running shoes has taken the market by storm and signed Joe Root, who is currently the golden boy of English cricket. A stylish batsmen, great personality and a young man who has his feet firmly on the ground, Joe Root is the perfect brand ambassador and now New Balance have him. In addition to Joe, they also have another similar sportsman in Australia’s Steve Smith. Steve is another calm and mild mannered gentlemen whose batting prowess and style is always on display at the crease. Our first delivery is due in December and expectations are that this year is going to be a New Balance Christmas. They have produced a small and concise range that covers the key batting pad batting gloves and cricket bat elements. They have two ranges available, the first is TC which stands for traditional cricket and then it’s the DC range which stands for dynamic cricket. Joe Root will be using the TC range which has the red and yellow colour scheme and this will be the one available in December. 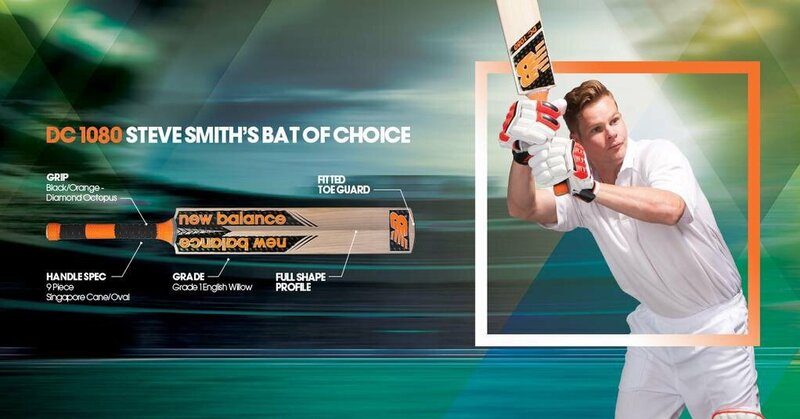 The DC range as used by Steve Smith is in the black and orange design and due in January. Each respective range contains three price points of bat, pad and glove and all credit to New Balance in that the products are not overpriced at all, in fact when we were first shown the range I was surprised at the prices considering the quality. The fit, comfort and protection levels are all top-quality and personally I don’t see any reason for why this new range will not be a phenomenal success. We are due to go live with the full product range on our website from December 1 with deliveries to be available very soon thereafter. Anyone that needs any further information please feel free to drop me an email on vinay@vks.com. This entry was posted in Cricket Bats and tagged new balance cricket bats, new balance cricket equipment.